Egos were bruised, stereotypes destroyed. City pride hurt. On the night of Sept. 12, 1949, on a newly lighted home field, the heavily favored Heber Springs Merchants Baseball Team was defeated, 5 to 3, by a pitcher who was a girl. Before a “Standing Room Only” crowd, the loss to a Van Buren County squad was beyond painful; it was embarrassing, intolerable and unacceptable. “The National Pastime” was a man’s game, a “macho” sport, too demanding for females, Americans of two generations ago fervently believed. Girls could not possibly play it skillfully. But Glenna Sue Kidd did. Born in Choctaw (Van Buren County) on Sept. 2, 1933 — barely 16 years before her legendary feat — she had been raised on the sport, thanks to a baseball-loving family. By her teens, she had proven useful on the Choctaw Town Team, managed by her father, who in early July 1949 maneuvered a tryout for her at Little Rock’s Ray Winder Field. It was prior to the first of two games played by a pair of touring teams from the All-American Girls Professional Baseball League (AAGPBL). The 15-year-old so impressed league officials that she not only gained a contract with the Springfield, Ill., Sallies, but also pinch-batted for them in the second game on the second night of the stay. Immediately following her debut, she joined a summer-long exhibition tour with the Sallies that had her playing in 25 states while mastering the subtleties, baseball and otherwise of “the pro game.” She acquitted herself admirably, even hurling a no-hitter. When the tour ended on Sept. 5, she was hardly poorly conditioned for the 9-inning, 6-hit gem she hurled in Heber Springs a week later. Nor was she ill-prepared for the five seasons of grueling multi-position AAGPBL play that followed. Upon graduating from high school in the spring of 1950, Glenna Sue launched half-a-decade of successful major-league competition, most of it as a pitcher and with the South Bend, Ind., Blue Sox. Only in her rookie year, divided among three clubs, did she produce a less-than-impressive win-loss pitching mark, 1 and 10. Yet, even in that season, her earned-run-average (ERA) — her worst as a professional — was a sparkling 2.94. 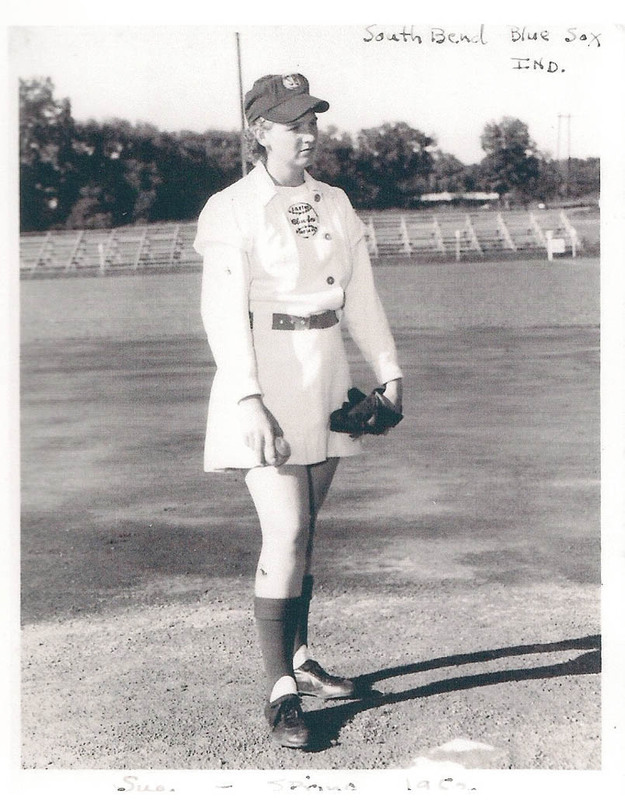 During 1954, however, there was little gayety or frivolity in AAGPBL ball parks. While Glenna Sue enjoyed a creditable 9-win and 6-loss season and a career-high .238 batting average, financial difficulties persistently plagued the league and its teams. Finally, AAGPBL coffers were bare and another season impossible. Glenna Sue reacted constructively. She called upon other athletic skills developed in Choctaw, and for seven years played professional basketball with the Rockettes of South Bend, while also working in the area. Her father’s heart troubles interrupted, however, and returned her to Van Buren County for a year. In 1961, her beloved father dead, Glenna Sue honored a promise she had made to him and enrolled in the Arkansas State Teachers College (now the University of Central Arkansas). She completed an undergraduate degree in physical education. Eventually, too, she earned a master’s degree in physical education from the same institution. Richly credentialed, both in the classroom and away from it, she proceeded to coach and teach for a quarter of a century, largely in Indiana. Thereafter, until her 2017 death in Choctaw, she devoted her versatility to the dog-grooming business and to assisting in tax preparation. Van Buren County and the 501 are proud that the fearless, strong-armed precedent breaker had her roots in their soil.